I don't know anyone that doesn't like cheesecake. It's smooth and creamy with a buttery crust. It's not hard to make either, surprisingly. 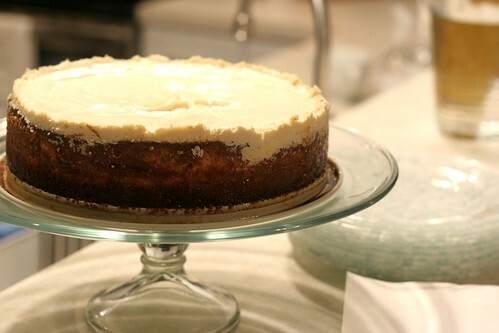 One of my favorite cheesecakes has a layer of sour cream baked on top, which just adds to the creamy texture. Mom told me she would like a cheesecake for her birthday this year. Done. 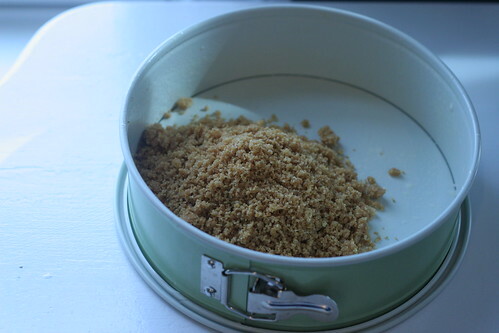 To make the graham cracker crust, just make crumbs in a food processor. Mix it with butter and sugar, and press into a 9-inch spring form pan. Bake it until it's golden and your kitchen smells like buttery heaven. The filling is just cream cheese, cottage cheese (surprising, right?! ), eggs and sugar. You want to beat the cream cheese for awhile first, to make sure it's nice and creamy. Then mix the rest and pour it into the crust. Bake it at 350 degrees for 45 minutes or so, until it's set in the middle but not over done. If you don't have a crack in the middle - hooray! 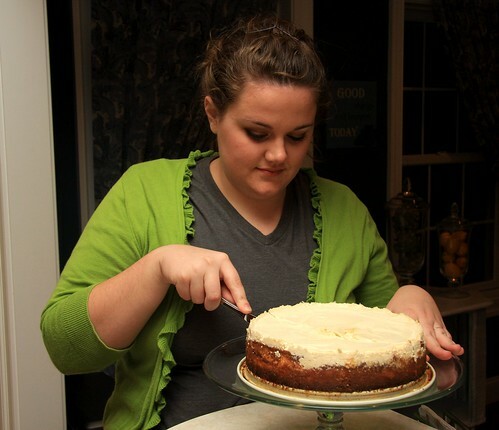 You are an expert cheesecake baker. Mine usually has a crack, but I've never tried to make a cheesecake in a water bath. I've heard that helps. Next time fo sho. 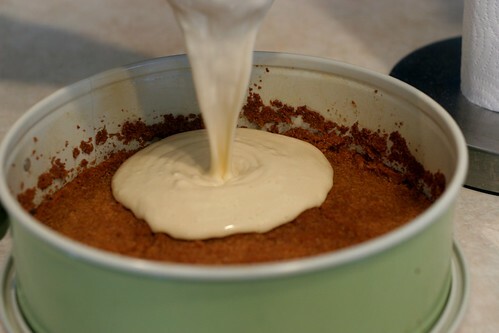 After the cake comes out of the oven, you spread a layer of sour cream and sugar on top. Then bake it again until it's just set. Oh my goodness. 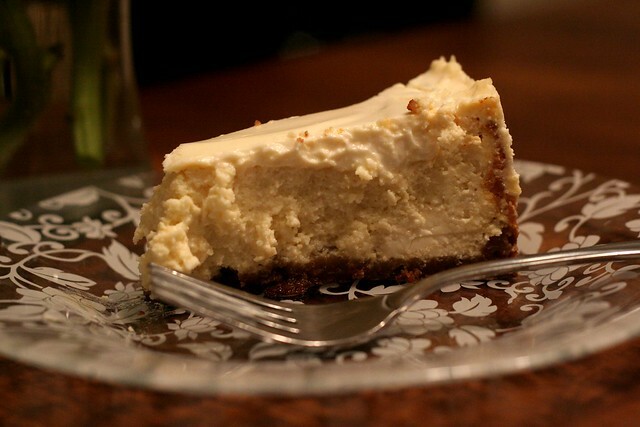 This sour cream cheesecake is to die for. Such a wonderful, creamy texture and not overly sweet. It was the perfect addition to Mom's birthday party. You will also be happy to know that it is somewhat low-fat. I hope you try it! Preheat oven to 350 degrees. To prepare crust, combine the first 3 ingredients in a bowl. Firmly press the crumb mixture into the bottom and 2 inches up the side of a 9-inch spring form pan sprayed with cooking spray. Bake at 350 degrees for 10 minutes or until golden brown, and cool the crust on a wire rack. To prepare filling, combine cottage cheese, 1 1/2 tablespoons vanilla, salt, and cream cheese in a mixer. Mix until creamy and fluffy, 4 -5 minutes. Add eggs, one at a time, stirring after each addition. Add 1 cup sugar, mix until just blended. 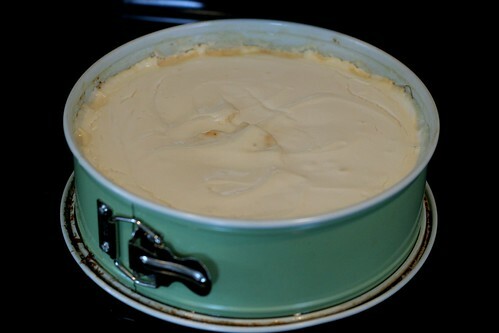 Pour the cheese mixture into the prepared crust, and bake at 350 degrees for 45 minutes or until the cheesecake is almost set. Remove from oven, and let stand 10 minutes. Increase oven temperature to 450 degrees. To prepare topping, combine 3 tablespoons sugar and the remaining ingredients. 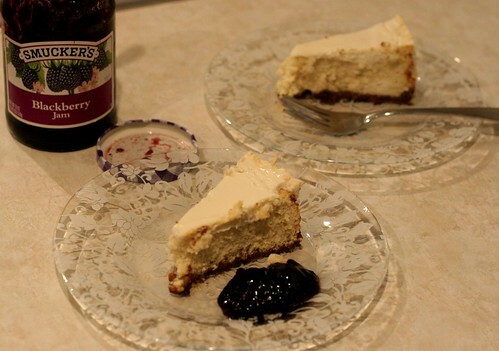 Spread evenly over cheesecake. Bake at 450 degrees for 5 minutes or until set. Cool completely on a wire rack. Cover and chill 4-8 hours. This was so incredible yummy! That cheesecake was ridiculously delicious! !